Left: Former International Relations and Co-operation Minister Maite Nkoana-Mashabane. 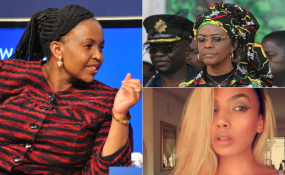 Top right: Former Zimbabwean First Lady Grace Mugabe. Bottom right: Model Gabriella Engels. Council for the Department of International Relations and Cooperation, Hilton Epstein SC, then interrupted. "The minister's case is that she was allowed to grant spousal immunity under international customary law... Whether Mr Mugabe is no longer the president, the minister's position is that the law must take its course."